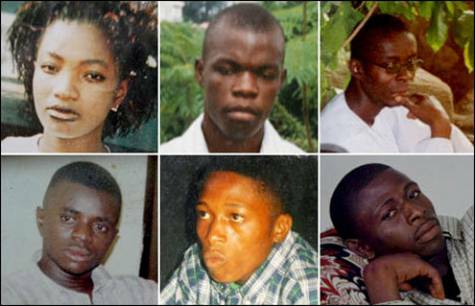 Police reinstates officer indicted in the APO six murders – Royal Times of Nigeria. The Deputy Commissioner of Police, Ibrahim Danjuma, who was reportedly responsible for the extra-judicial killing of five young auto spare parts traders and a young woman on June 7, 2005, in Apo, Abuja, has been reinstated by the Nigerian Police Force (NPF), Sahara Reporters reports. It could be recalled that the victims, Ekene Isaac Mgbe, Ifeanyi Ozor, Chinedu Meniru, Paulinus Ogbonna, Anthony Nwokike, and Augustina Arebu, were returning from a nightclub when they were stopped at a police checkpoint and murdered by a team of policemen led by Mr Danjuma. The killing of the six persons sparked national outrage. The police had claimed that the victims, aged between 21 and 25 years, were members of a robbery gang that had shot at the officers at a checkpoint. A judicial panel of inquiry set up by former President Olusegun Obasanjo dismissed the police account as false and recommended the trial of the officers for extra-judicial killings. The trial dragged on until two of the officers were sentenced to death in March 2017, Danjuma was freed by the judge who sat on the case. The officers accused of the killings and eight other police witnesses eventually testified before the panel of inquiry that Mr Danjuma, the Deputy Commissioner of Police and the most senior of the accused, had ordered the killings. The report of the panel stated that the victims were at a nightclub located at Gimbiya Street, Area 11, in Abuja that night of June 7, 2005, when they had a face-off with Mr Danjuma after the only female among the victims, rejected Mr Danjuma’s romantic advances. As published by Sahara Reporters, the directive for the officer’s reinstatement was contained in a Police wireless message (DTO 1718000/11/2017) addressed to the Police Service Commission. According to the wireless message, the reinstatement of the officer and other police officers included in the message followed their successful “appeal of their dismissal from the Force“. The other officers are Fausat Azeez Oduwole, an Assistant Commissioner of Police; Bethram C Onuoha, Chief Superintendent; Okwuonu Allwell, Chief Superintendent; Nonyerem Ejike Akubuike; a Deputy Superintendent of Police; Barakiya Yusuf and Onuorah Emmanuel, both Assistant Superintendents of Police. However, Oseni Tajudeen, whose appeal was rejected, had his dismissal upheld. The wireless message showed Mr Danjuma will be paid the arrears of his salary dating back to June 18, 2005, and sent on a refresher course.